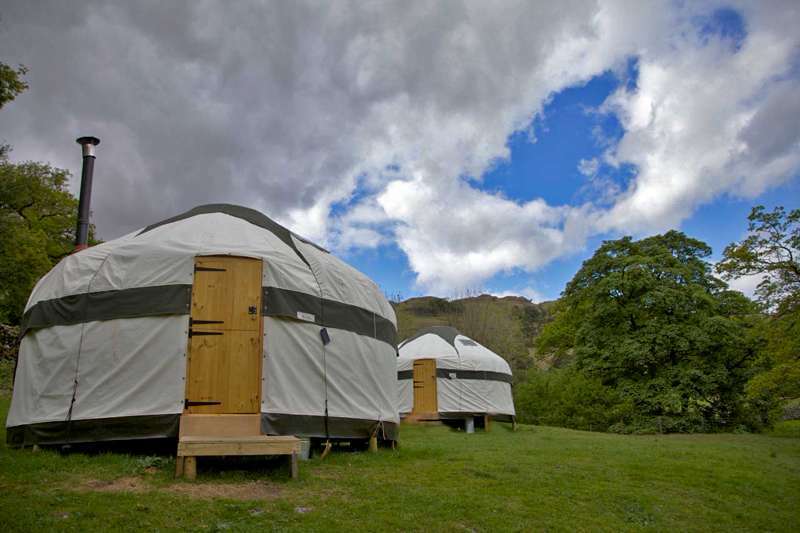 Welcome to Kentmere Farm Pods on our working family farm in the Lake District National Park. An adventurer’s paradise in South Lakes – great for exploring on bike or foot from the door or simply relax and chill out. 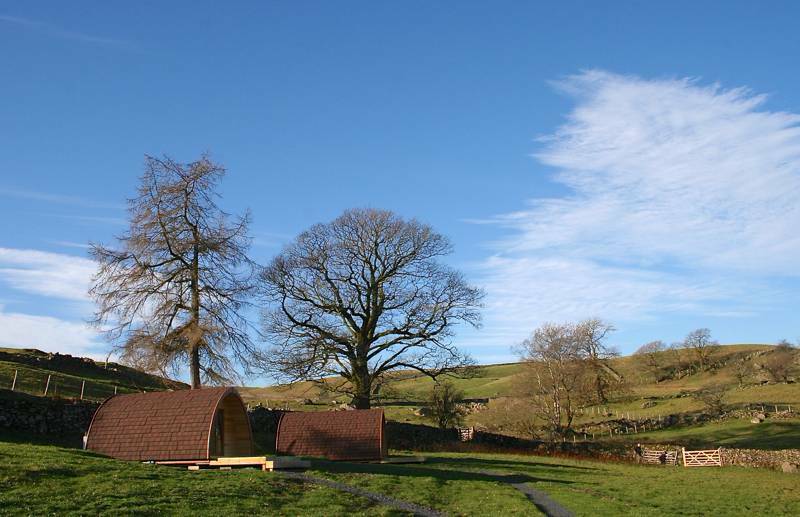 Our luxury Glamping pods offer a unique, peaceful retreat in the stunning Kentmere valley. Ditch the tent pegs and still enjoy those special outdoor experiences with a few home comforts! 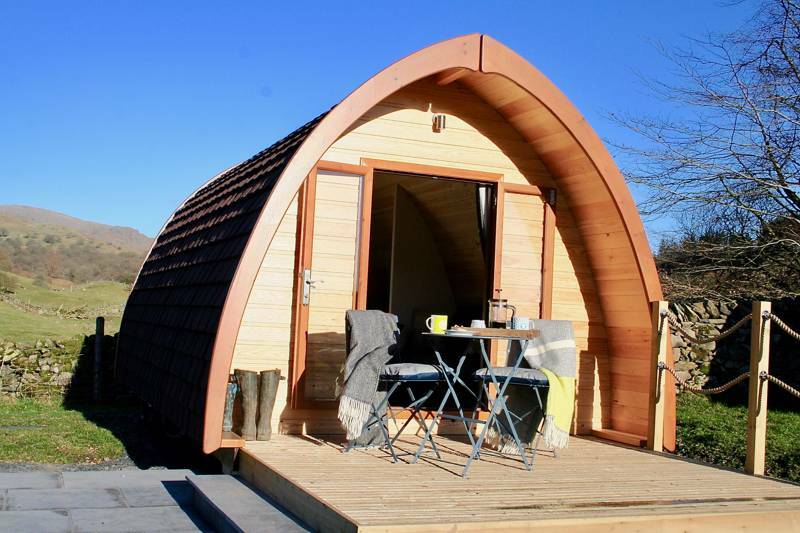 Each pod sleep four comfortably with a double bed, sofa bed, bedding and linen provided. The pods are insulated and heated so you can get cosy and there is an en-suite shower/toilet as well as a kitchen area with microwave and fridge. 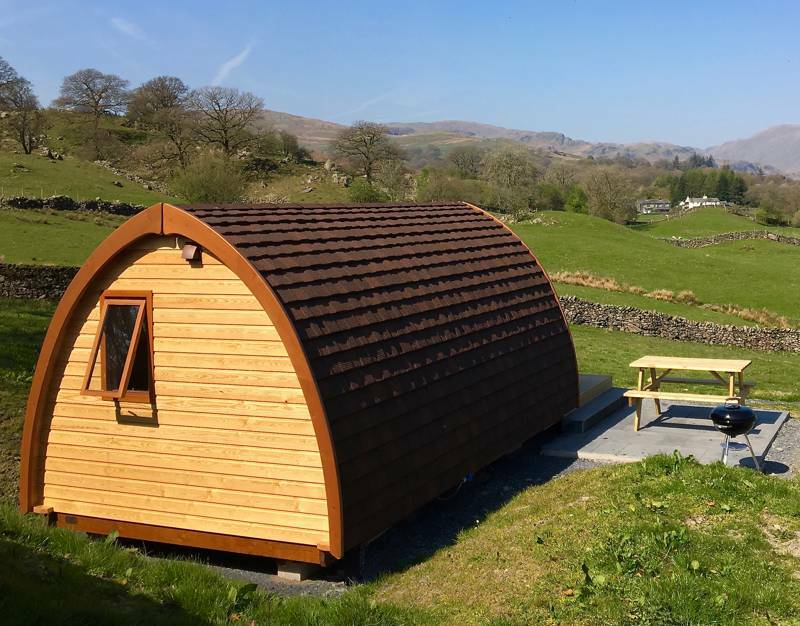 Our four pods are sited in their own large field, with spectacular views of the Kentmere Valley and surrounding Lakeland fells. With no light pollution, on a clear night, the sky here sparkles with stars, so light up the barbecue and enjoy. If you want a campfire there are fire-bowls for hire. Our farm is 500 acres, covering a variety of pasture-land, woodland and high fell, with the River Kent and streams winding through. As well as sheep, cows and hens, you will see a wide range of flora, birds and wildlife and we work closely with Natural England to deliver responsible and environmental farming. We are two miles from the thriving village of Staveley, along a quiet country road, with some great cafes, shops and pubs. 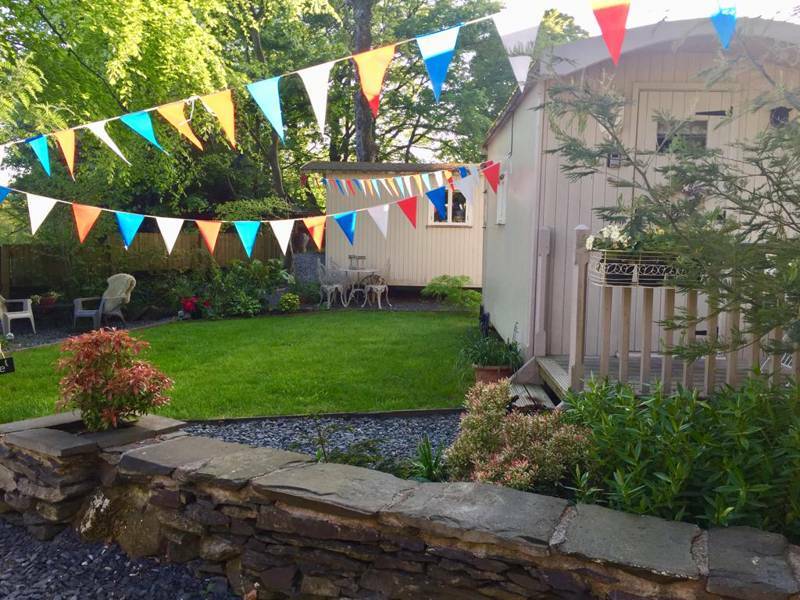 The nearest towns are Kendal and Windermere and there are loads of activities including; water sports, riding, climbing and culture spots as well as great places to eat nearby. For latest availability and best prices for Kentmere Farm Pods, please use the Date Search above. Each pod is insulated with under floor heating and double-glazed, lockable french doors. There is 1 double bed and 1 double sofa bed, plus a compact kitchen area and an en-suite wet-room-style shower, toilet and basin in each pod. Bedding and linen is provided (duvets, pillows and blankets) and towels are available to hire. The kitchen has a fridge, microwave, toaster, kettle, crockery and utensils. There is also a kitchen table and chairs. Each pod has down-lighters inside, power sockets and external lighting for the decking area. Outdoor bistro style seating and table are provided on the wooden decking as well as a picnic bench and barbecue (charcoal sold on site) on the stone patio. There are also boot storage boxes for each pod that double as seating. No WiFi (though good 4G coverage in the village, plus board games and books on the local wildlife to keep you occupied). Fire bowls available to hire. There is an area to wash bikes and they can be stored in a secure shed. The pods are on a working farm, home to sheep, cows, hens and ponies. 2 River Kent fly fishing permits on the land (stocked with trout), if you have a National River License and a rod please ask Kentmere Farm Pods for permission and where to go. Explore from the door with footpaths straight from the farm. Wander down the lane and play pooh sticks from the old stone packhorse bridge, head off on the 3-river loop or try Alfred Wainwright's favourite walk: an epic 7-hour-long trek known as the Kentmere Horseshoe, which takes in Yoke, Thornthwaite Crag, Shipman Knotts, Mardale Ill Bell, Kentmere Pike, Ill Bell, Harter Fell (Mardale), Goat Scar, and Froswick – warning, it's one of the longest and most remote walks in the Lake District. There is something for all ages and abilities, though, with particularly pleasant walking along the river valley. The ancient oak woodland along the riverside just south of Staveley was once used for making bobbins and is now home swathes of bluebells, early purple orchids and wild garlic (spot redstarts, flycatchers and great spotted woodpeckers). Head over the valley top with a round trip to Potter Tarn (3 miles) and Gurnal Dubs, just beyond, fantastic for wild swimming in summer (or very chilly dips in winter), while, in the opposite direction, wallow in the river in Kentmere or paddle in the Kent near the pods. There are great biking routes, too, with some challenging rides over Garburn into Troutbeck and up Greenside, following old packhorse trails. In the Lake District more generally, all the larger lakes have boat hire – canoeing, sailing, windsurfing, rowing, kayaking and paddle boarding, with the nearest available in Windermere. Holmescales Riding Centre (01539 729388) and Larkrigg Riding School (015395 60245), both near Kendal, offer horse riding for all ages. For culture, Abbot Hall (01539 722464) in Kendal has some fantastic contemporary exhibitions or try the Brewery Arts Centre (01539 722833) for shows by local artists. It's a 5-minute bike ride (2 miles) is Staveley, a thriving village with shops and cafes on the main street. The old mill yard, an initially slightly industrial-looking area – has been converted into a series of shops and outlets (including a humongous bike shop). For an informal bite, try Wilfs Café (01539 822329; dog-friendly) – great for breakfasts, lunches and snacks – or, a few yards further, try More Artisan Bakery (01539 822297), with a hipster feel and a very cool vibe, serving coffee and, of course, heaps of bread and baked treats. It's a good place to stock up if you're heading into the hills. Out on the high street, Mr Duffins coffee shop (01539 822192) has great coffee, which is freshly roasted on the premises, while Café Eclec (01539 821393), not only serves soups, snacks and cakes but it also an antiques shop. If its pub food you’re after, The Eagle & Child (01539 821320) serves good ales and wholesome food, with a garden right next to the river for sunny days, while The Hawkshead Brewery (01539 822644; back in the old mill yard) has a good vibe, brews its own beer on site with a large lounge upstairs serving tasty food. The village also has a Spar for groceries (there are larger supermarkets in Kendal), a Post Office serving sandwiches and bacon butties and a local butcher. For real local produce, Low Sizergh Farm Shop (015395 60426) is well worth a stop. From the Kendal direction, take the A591 and look out for Staveley signposted on the right hand side of the road (slip-way-style junction; it's 2 miles after the Sizergh roundabout). Turn off here and follow this road through Staveley village, turning right for Kentmere just before the village hall (from the Windermere direction on A591, the turning for Staveley is on the left, beyond Ings, and takes you on to Danes Road; turn left for Kentmere just beyond the village hall). From the turning by the village hall, drive for 1 mile and the road turns right over a bridge. Ignore this and stay on the left hand side of the river. Go straight on up Browfoot Lane, keeping left of the river, for about 2 miles. The property before Kentmere Farm Pods is Goose Howe, 4 fields further, on the right, there's a sign on the right hand wall for Browfoot Farm. Turn in here. Down the drive, take a right in front of the two red doors, past farm buildings and left just beyond the grey barn. Kentmere Farm Pods are extremely accommodating of anyone who wishes to travel by public transport and it is easily done. Staveley railway station is on the branch line that connects Windermere to Kendal and Oxenholme mainline station. It's around 50 mins to Kendal from Carlisle, 1¾ from Manchester, 2½ from Glasgow, 2¾ from Leeds and 3hrs to Kendal from London (though all times vary). You can take bikes on the branch line but you need to book in advance. 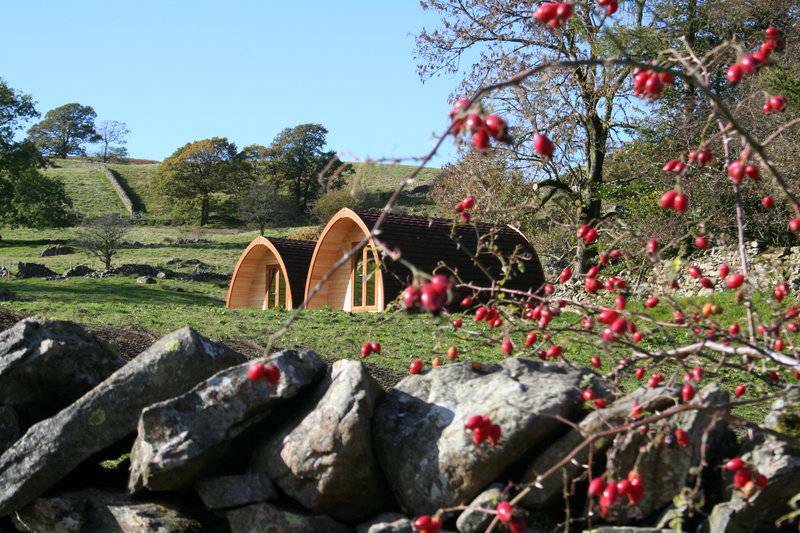 It's a flattish, rural 2 miles from the train station to Kentmere Farm Pods. If you do arrive on foot or by bike, Kentmere Farm Pods will provide free towels and are happy to get groceries for you in advance if you give a week's notice. For other travel and general exploring, the 555 bus service runs through Staveley to Kendal or to Windermere, Ambleside and Keswick. Mountain Goat (01539 445161) is a private minibus service that can connect you from Windermere all over the lakes. 4 luxury pods, each sleeping up to 4 people.